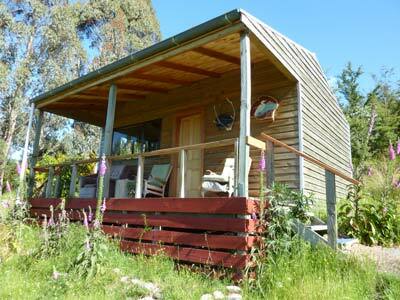 The cabins comfortably sleep 3, or 4 at a squish! Heron lodge sleeps up to 5. Great place. beautiful scenery, this is really different. Beautiful place with awesome views of Lake Manapouri. 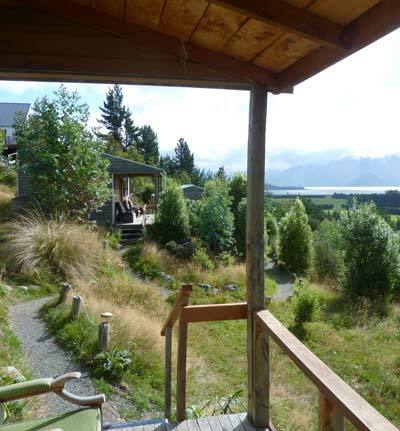 The owner is very nice, friendly and helped us out, not only when we had problems starting the logfire spacious rooms, great shower, cute horses :) and an amazing view of Lake Manapouri and the Fiordland mountains … one of the best stays in NZ! The rooms are spread over a few houses, each equipped with its own kitchen/lounge. Le top! Lovely warm fires, friendly hosts and horses! Jimmy and Jack built these 5 cute timber lodges which are named after native birds, and Jimmy’s son Heath did the sign art work. Four of the lodges are now turned into spacious doubles, with made-up queen size beds, a two seater lounge, a four seater table, a wood burner and a little kitchen with a 2 gas burner unit. There is enough space for another double mattress or baby cot if needed. 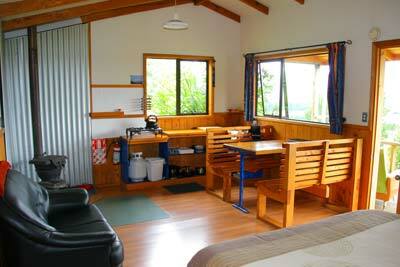 All lodges run on solar energy which provides the light so there are no other power outlets inside the lodges. You will maybe have the quietest, deepest and longest sleep on your journey. There are no doors banging, no toilets flushing, just a few birds in the morning and maybe a horse’s head staring into the window. You will wake up to amazing views, breakfast on your own verandah without sandflies. Or if it's raining, snuggle up again, or put the fire on, read a book from our library or just dream away and chill out. 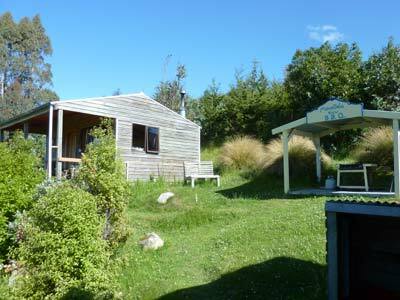 Heron lodge is slightly bigger and sleeps up to 5. Apart from this, it has the same features as our cosy cabins; spectacular views and a cosy fireplace. It’s ideal for a small group or a family. The toilet block for these 5 lodges with hot and powerful showers is a little stroll down the hill where you'll also find a fridge, freezer, washing machine, dryer and the information board. 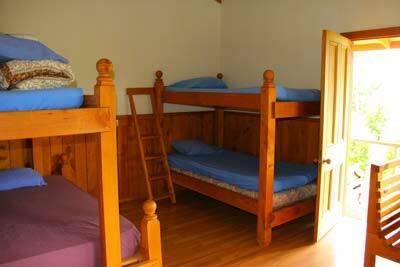 The concept of these lodges is very different when compared with other backpackers. It is more private and quiet, there is no common room with TV, but if you like to meet people there are many ways: go and visit them in their lodges or invite them into yours, meet at the BBQ area, watch the sunset together from the verandah of the main lodge or come for the odd social night or concert at our house. If you prefer the comfort of a house with TV, power points, a sitting room and a larger, fully equipped kitchen and no starry walk to the loos, you could choose our holiday house. So what would be good to bring? Good wine, time, books, games, the loved one, a torch and maybe an umbrella or a musical instrument… Of course you can check the internet, store your luggage and charge up technical equipment at no extra cost, make a free call to book your next accommodation, or improve your skills in wood chopping. We’re sometimes quite happy for a helping hand, especially during the season. Freestone is simply a paradise from which to explore Fiordland. We’ll do our best to help you to plan your holiday here and offer a free booking service for all activities in Fiordland.